Sunshine this morning. Becoming mostly cloudy with showers developing this afternoon. High 71F. Winds SW at 5 to 10 mph. Chance of rain 40%.. Some passing clouds. Low 39F. Winds light and variable. 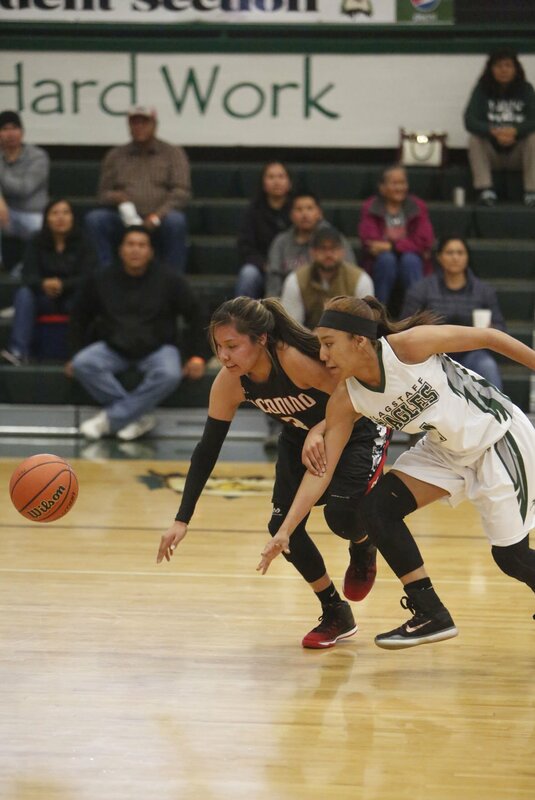 Coconino High School’s JJ Nakai (3) chases the ball alongside Flagstaff High’s Monique Ware (4) during Saturday’s crosstown matchup at the Pepsi Holiday Tournament. Coconino High School’s JJ Nakai (3) moves around the Flagstaff defense during game action at the Pepsi Holiday Tournament Saturday. Coconino High School’s Kaylee Begay (23) runs the ball during game action against Flagstaff High at the Pepsi Holiday Tournament Saturday. Coconino High School’s Kortnee Begaye (44) jumps against Flagstaff High School’s Noni Thomas (14) during tip off of a game at the Pepsi Holiday Tournament. As the clock ticked down, Coconino Panthers point guard JJ Nakai gingerly tossed the ball toward the referee and embraced her smiling team at the baseline. As climactic as that moment was, a three-day tournament can be draining, even for an experienced player. And while the players felt exhaustion, the parents felt excitement, meeting the girls basketball team with applause and cheers. After a long battle against the St. Mary's Knights in the War Memorial Gymnasium at Flagstaff High School on Saturday, the Panthers walked away from the Pepsi Holiday Tournament with a 50-40 win and a third-place finish. Earlier that afternoon, the Panthers dropped their only game of the tourney, losing 56-46 to their crosstown rivals, the Flagstaff Eagles. Prior to the loss, the Panthers couldn't be stopped, winning 59-36 against the Mojave Rattlers and 49-19 against the Lake Havasu Knights on Thursday, and beating the Hopi Bruins 65-27 on Friday. The final day of the tournament was met with aggressive, hard-fought games, with Nakai taking a nasty spill early in the fourth quarter against the Eagles that required her to sit on the bench for a while. Nakai eventually came back, but the Panthers failed to close on the Eagles’ double-digit lead. Despite the injury, she came into the third-place game against the Knights with confidence. With 21 points, Nakai showed just how ready she was. Jada Golding, the 5-foot-5 guard, faced an injury during their meeting against St. Mary's, running head-first into the shoulder of a defender as she sprinted for the ball. After taking pause on the floor, she spent the rest of the game gathering herself on the sidelines. Before the injury, Golding scored five points, including a short jumper that drew a foul and allowed her to capitalize on the extra point opportunity, extending her team’s lead. After seeing his team take third place, Reyes said this year’s Pepsi Holiday Tournament should serve as a learning experience. Addressing the loss against the Eagles, Reyes said his team put too much pressure on themselves. But for Reyes and his team, every game is a learning experience, and their third-place finish just means they have some room to grow.